Star anise is the star of the culinary show with these chocolate fondant cakes with orange ice cream, adding spice to what is a fairly traditional cake. For the orange ice cream, make a crème anglaise first. Heat the cream, milk and orange zest in a saucepan until just boiling. Remove from the heat and set aside to infuse for 5-10 minutes. Beat the egg yolks and sugar together until well combined. Whisk the cream mixture into the eggs, pour the mixture back into the saucepan and return to heat. Stir in the orange juice and continue to cook until the crème anglaise thickens (but not boiling). Set the crème anglaise aside to cool, then chill in the fridge. Churn two-thirds of the crème anglaise in an ice cream machine, according to the manufacturer’s instructions. Transfer the ice cream into an ice cream container and chill in the freezer until needed. Pass remaining crème anglaise through a sieve into a bowl, cover with reusable wrap and chill in the fridge until needed. For the star anise chocolate fondant, preheat the oven to 180°C and grease four ramekin dishes. Add a small amount of the grated chocolate to each, turn them to coat the sides and bottom, shaking out any excess. Bring a little water to the boil in a pan, then reduce heat until the water is simmering. Suspend a heatproof bowl over the water, not allowing the base of the bowl to touch the water. Melt the chocolate and butter together in the bowl, then remove from the heat and whisk in the ground almonds, egg yolks, cornflour and star anise. In a separate bowl, whisk the egg whites until stiff peaks form when the whisk is removed. Whisk in the sugar, a little at a time. Fold the egg white mixture into the melted chocolate mixture. Half fill the ramekins with the chocolate mixture, place a chocolate truffle on top and fill the ramekins with the remaining chocolate mixture. Place in the oven to bake for 10-15 minutes, or until risen and slightly wobbly. 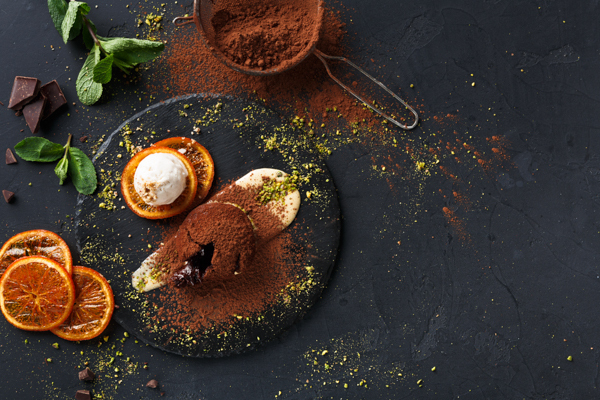 Sprinkle with any remaining grated chocolate and cocoa, before serving with mint leaves and orange slices.